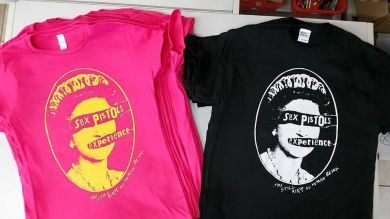 lovely Punk ladies in Pink..! We have new stock of our Ladies-cut Pink tee's with yellow print on the front, + back print. Available in Medium / Large / X-large - please note, 'Ladies sizes are much smaller than men's, an XL is similar to a men's medium size. add a message with size required. �12.00 inclusive of u.k postage, for Europe please add �2.00 P&P at your paypal checkout.